No person can prove to another that God exists. But in this book we read: God in us! Who can say such a thing? A person who experiences God in herself. It is Gabriele, the prophetess and emissary of God in our time, who lives in God and shows us how each person can prove for himself that God exists and that He dwells in us. There is a lot of talk about God and a lot is written – but who knows the truth? The fact is that no person can prove to another that God exists. Nor can any external religion, any church institution, provide the proof that God truly exists. But in this book we read: God in us! Who can say such a thing? A person who experiences God in herself. It is Gabriele, the prophetess and emissary of God in our time, who lives in God and has been giving humankind His word of truth for 40 years. In this book, Gabriele gives food for thought, impulses and aids, so that each person can prove for himself that God exists and that He dwells in us. And so, each person can experience God for himself, thus gaining the joy and certainty that God is in each one of us. God is in all life forms. God is present in all things. The basis for this book is the compilation of four television programs entitled “Your Devotional – The Free Spirit. God in Us,” in which several followers of Jesus of Nazareth participated. The content of the programs is given by Gabriele, who, as the emissary of the Free Spirit, gives the truth to all God-seeking people from her rich treasury of experience and from the horn of plenty of divine Wisdom. The program texts have been edited for this written version and are passed on in this book. “God in Us” shows the reader the path to freedom, out of confining religious beliefs, out of rigid traditions, out of binding institutions – toward God, toward God in us. 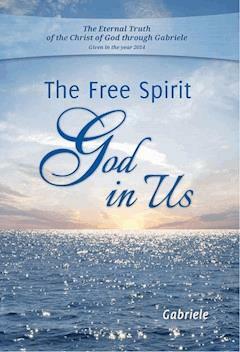 The topic “God in Us” is a provocation for many people in our time. When you read and listen via the media about what is becoming apparent in this world, the word GOD slips more and more into the background, to say nothing of the statement “God in Us”! We hear about the disasters in this world and how people are acting toward their fellow humans, that is, how they treat their own kind, how they live in enmity with those who do not share their views. The Earth with its animals and plants suffers under the fraudulent labeling “Christian” – which means: “We do what Jesus taught” – under the egoism of exploitation. With countless arguments, the Earth is plundered; the animals are tortured and killed and nature is run down. Certainly, all this has nothing to do with God and Jesus. “God in us” is actually not an abstract term. Above all, it should not be an abstract term, if we believe in Jesus of Nazareth, in the Christ of God, who – as Christians say – is the Redeemer of humankind. One of His many teachings stands as a reminder. Jesus taught us that every person is the temple of God and that God, the Eternal, dwells in each one of us. So “God in us” is not an abstract term if we believe in Jesus, the Christ, in His teaching, yes, in His simple teachings. Unfortunately, we human beings are very warped in our thinking. We believe in church institutions that celebrate their rigmarole in the name of “Christian.” However, Jesus of Nazareth did not bring us any cult teachings. Instead, you, each and every one of us, are the temple of God and God dwells in every person, in every soul. Recently, many people have been thinking about this and many, yes, ever more people, are leaving the church institutions. We hear more and more about the debaucheries committed by the caste of priests, about hypocrisies, lies, and not lastly, about countless perversities and excesses that we don’t even want to call by name, unless we talk about ugliness and abnormality. Let us remember Jesus of Nazareth, the Christ of God, who rightly said: But you are not to be called rabbi, for you have one teacher, Christ, and you are all brothers. This applies, above all, to the ecclesiastical excellencies and eminences, to the entire caste of priests. Every person is more or less a sinner, including the priests. If we believe in the words “God in us,” then for each of us, the question is: Do we really need churches of stone? If God is in us, for what do we need priests, whom Jesus called Rabbi? Besides, Jesus, the Christ, taught us that the Kingdom of God is within, in us. Then why should we go to churches of stone, if the Kingdom of God is in us and God dwells in us? God is the law of life, and the law of life is freedom, because God is freedom and dwells in us. And so: God in us.